Did I mention I love our camera? This is the money shot here…and we were glad we were towards the end of the train so we could get these views of the locomotive. 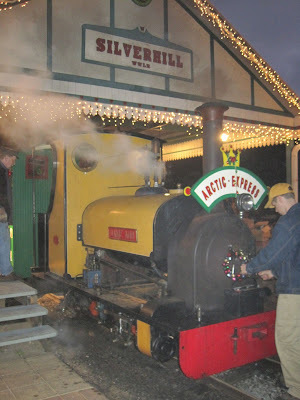 Dave had been telling me about the Durango & Silverton Narrow Gauge Railroad for many years. Okay, perhaps over 20 years. It was the highlight of a Colorado trip he had taken as a teenager, and he was excited for a chance to share the experience with the boys and me. So we made sure to include this on our southwestern vacation. 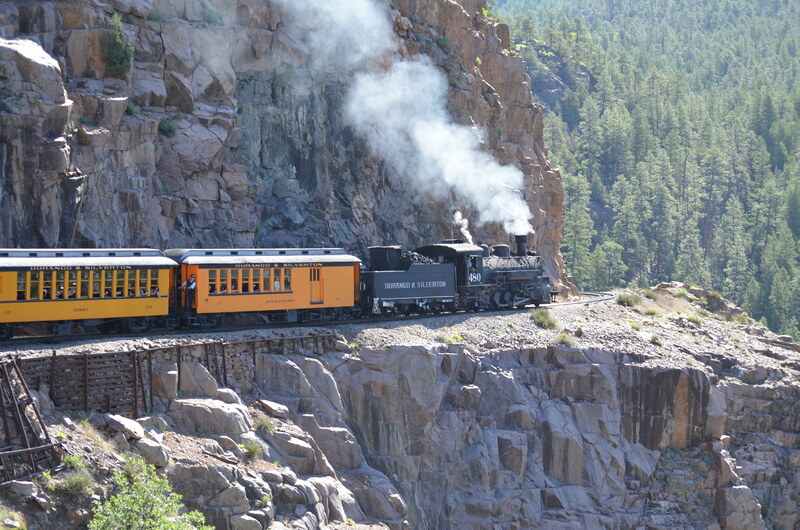 The Cumbres and Toltec Scenic Railroad takes you behind a steam locomotive through otherwise-uninhabited parts of southern Colorado and northern New Mexico. For Dave’s birthday, our family took an overnight trip to the quiet town of Antonito, Colorado for a trip on the Cumbres & Toltec Scenic Railroad. 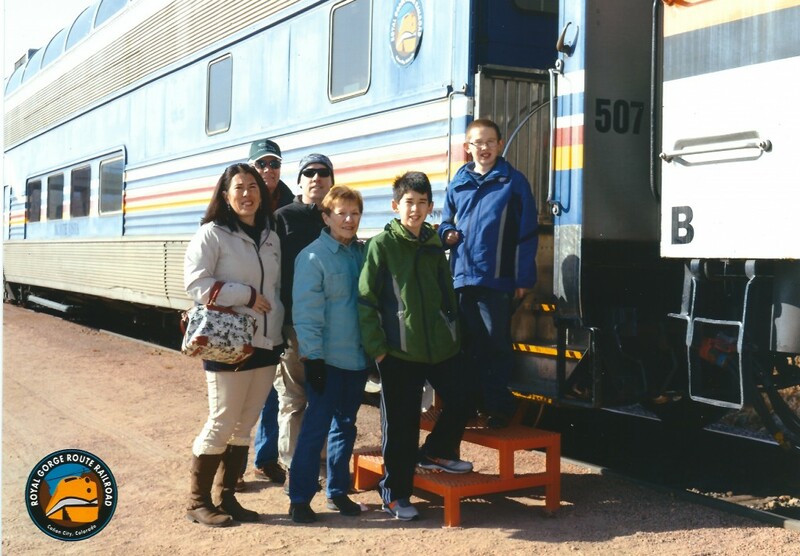 More Americans will have heard of other Rocky Mountain tourist railroads, such as the Rio Grande Scenic, the Royal Gorge, or the very-well-known Durango & Silverton. I personally haven’t been to any of those other tourist railroads, but they’re all located in bigger cities/towns/communities than the two endpoints of the C&T: Antonito, Colorado and Chama, New Mexico. 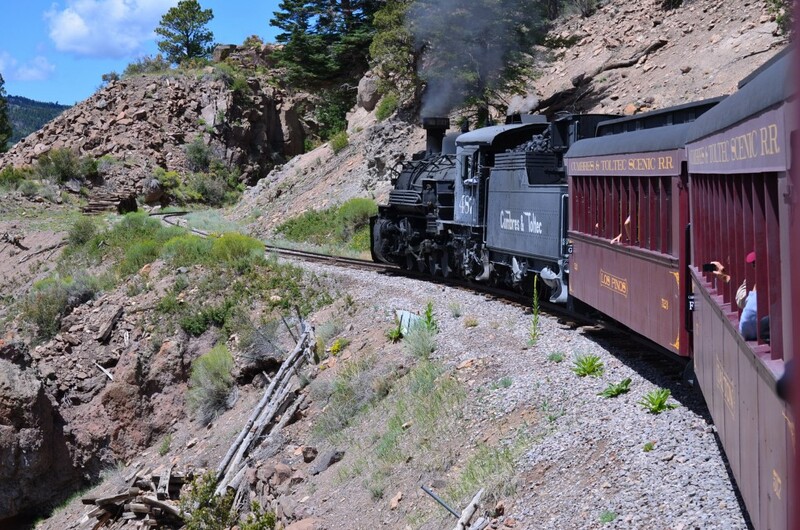 The Cumbres & Toltec is a narrow gauge railroad and is absolutely spectacular and takes you through some VERY uninhabited parts of southern Colorado and northern New Mexico. Jacob got home on Wednesday from a 3 week visit to New York with Dave’s parents. He had a very nice — and busy — visit. He had the chance to go with his Grampy to a classic car show in Stony Brook, he visited the Statue of Liberty in New York City, went to a Long Island Ducks minor-league baseball game, visited the New Hope & Ivyland Railroad in Pennsylvania, and he ate filet mignon at a restaurant not once, but twice! The filet mignon particularly tickled me because he’s alway so picky about the fat on steak. Wouldn’t you know, filet is now his favorite cut of steak. Here are a couple of pictures from his trip that Dave’s Mom took. He had a wonderful time! 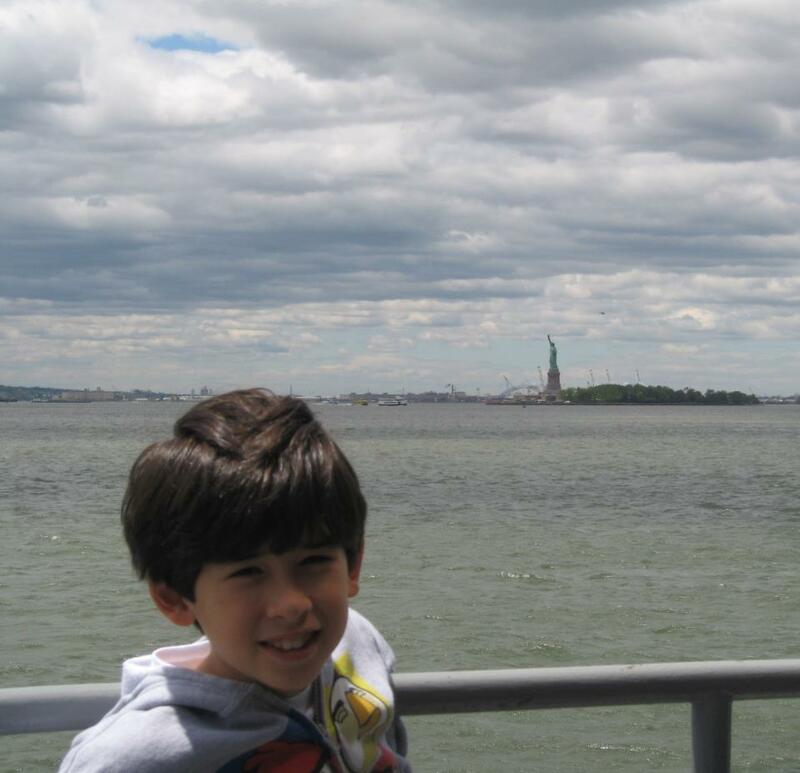 Here’s J on the ferry ride to the Statue of Liberty. I couldn’t get over his needing a hoodie on the same day that we were sweltering in the upper 90s down here in Florida. 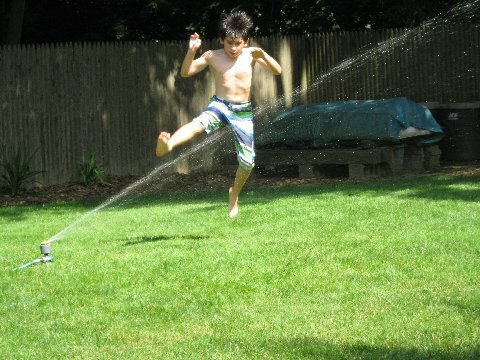 My mother-in-law got this fantastic picture of Jacob jumping in the sprinkler on a hot day in the backyard. This is officially called “The Confederate Memorial on Stone Mountain”. It’s the largest relief carving in the world…at least until the Crazy Horse Monument is finished. We all know who the guys are…who knows the horses’ names? As I’d mentioned in yesterday’s post about The Varsity, the only truly scheduled activity we had coming into Atlanta was a Sunday afternoon Braves game. So we had the entire city of Atlanta at our disposal for sightseeing. Dave, in his typical train-fan fashion, knew of a tourist scenic railroad in the area. So that’s what we sought to do. We decided to grab some same-day tickets to the Saturday night Braves game, and then headed out for the day to Stone Mountain Park which is about 15 miles east of Atlanta. We weren’t quite sure what to expect — several folks at the hotel breakfast area told us we’d have a good time and that there was “so much to do!”. Those folks were right! Stone Mountain Park is very beautiful and there was no shortage of things to do! We didn’t quite dress for hiking up the mountain (and Dave’s back wouldn’t have been to happy with it either), but we were able to enjoy the scenic train, the skytram right to the top of the mountain, a ferryboat ride, and a fun — touristy — lunch where our yeast rolls were thrown to us by our servers! Dave and I really enjoyed the Civil War history that’s been memorialized at the park — of course there’s the beautiful bas relief sculpture of Jefferson Davis, Robert E. Lee and Stonewall Jackson (and their horses!). There is also an antebellum mansion to tour, and a Confederate Museum. Perhaps because it was August in Georgia, who knows? The park was not crowded at all even on a Saturday, there were little-to-no lines for any of the activities we wanted to enjoy. First, the 5 mile train ride around the base of the mountain. The engine that pulled us. This is the walking trail up to the top (as seen from the train) — it’s straight up the sheer rock surface so it can get quite dangerous if it were rainy. 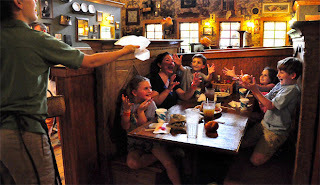 We enjoyed southern fried chicken and chicken and dumplings for lunch. Along with free tossed rolls, fried dill pickles, fried sweet potatoes and free fried onion petals…we were glad we ordered 2 entrees and 1 kid’s meal for the 4 of us! The lunch was yummy, but unfortunately was priced for tourists and our lunch for 4 was over $50. After lunch we visited the air conditioned Yogi Bear’s 4D Adventure. This was merely a stitching-together of 12-minutes worth of scenes from the 2010 movie Yogi Bear…the 3D version. But we were in a theater that added in real water and wind effects. We had seen Yogi Bear this past spring but it was fun to experience the water and wind effects. Next we visited the Summit Skyride, which was the gondola ride to the top of the mountain. The gondola has a capacity of 13,000 lbs., and when we were loading up, it was rather freaky seeing the load weight – displayed in tons – get higher and higher. Luckily, everyone fit on board at 5.1 tons. 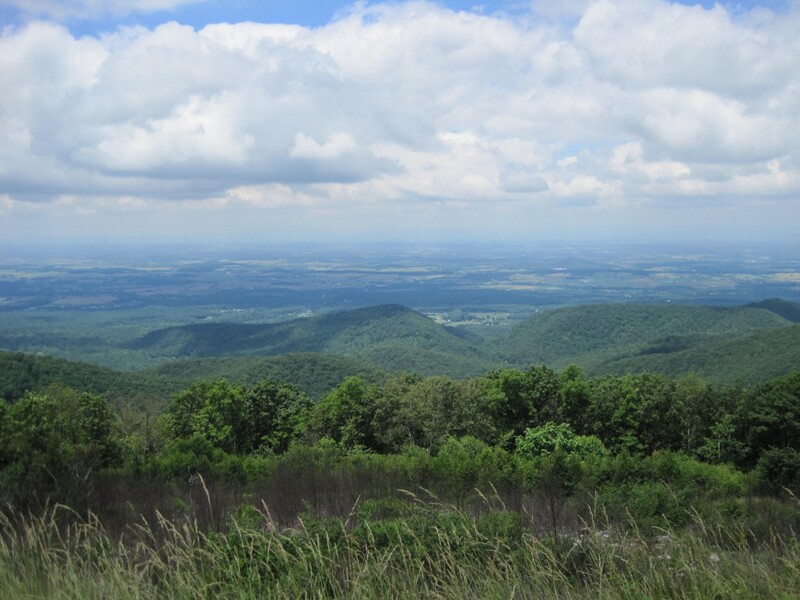 We enjoyed the views from the top of the mountain. Can you see the Atlanta skyline out there? Trust me, it’s out there! I have a lot of peak pictures of Dave: here and here. I have one of him on North Carolina’s Grandfather Mountain too…but that’ll have to wait till I get home and dig into my photo archives. I think this is the very peak of the mountain. But I could be wrong…. Timmy was very curious about these circular depressions in the granite. It’s from rainwater “soaking” some of the softer minerals in the rock…when the water evaporated, the dissolved minerals would go with it. 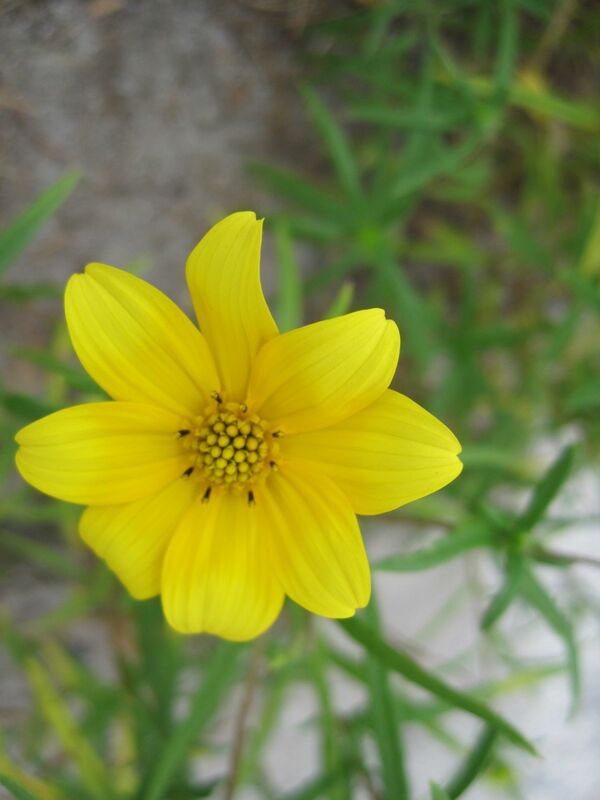 This is the very pretty — and very rare — Confederate yellow daisy. There’s a festival in September to celebrate it’s full bloom, but they were just starting up about this time of year. 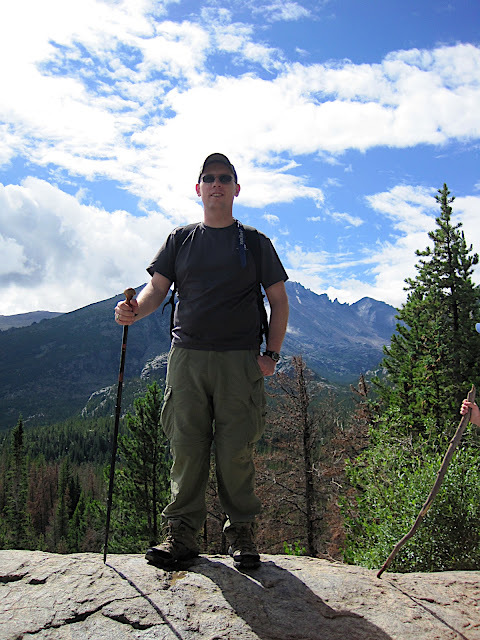 Jacob took this nice picture of Dave and me…I like the rainshower on the left side of the picture, in the background. This black swallowtail butterfly was fluttering among the yellow daisies. Way up on top of the mountain. Love how my 12x zoom captured even the detail of the granite of the mountain top. There was a tiger swallowtail, too, but he wouldn’t land anywhere for me to photograph him. We cooled off at the air conditioned Memorial Hall Museum, which has exhibits about the geology of the mountain…and a lot of the Native American and early American artifacts found nearby, as well as exhibits about the making of the bas relief sculpture and the Civil War history in the area. A view of the “Memorial Lawn” – laser light shows are held every night at 9:30pm during the summer. We’d have loved to have seen one; apparently their lightshow rendition of “The Devil Went Down to Georgia” is pretty well known. Dave might actually be sleeping here…we were all pretty tired by this point. View of Stone Mountain from the riverboat. I’ve never done a “Wordless Wednesday” before, but I thought we’d have a good time with these pictures Dave and I took of Amtrak’s 40th Anniversary exhibit train at the Strasburg Railroad in June, pulled by a P40 locomotive. Considering these to decorate Jacob’s room, since he’s a fan of Amtrak.